Nineteen-year-old Priya has lived in the shadow of the forest all her life. She knows the rules better than anyone. Do not go into the forest alone and never stray from the beaten path. Her village has lived in tentative peace with the inhabitants of the forest for decades, until the day that someone breaks the rules. From the dusty heat of the village, to the icy grandeur of the Capitol, Priya must make an impossible journey.Will she succeed in delivering a message that could save them all? My dad inspired me to write this book. He loved Hindu Mythology and was always encouraging me to learn more about my Hindu heritage. When we discovered he was sick I was overcome with the urge to write a book just for him. Forest of Demons is a labor of love, a book for my dad who is no longer with us today. I'm just grateful he got a chance to read the first draft, and I know he would be so excited and proud of me for getting it published. Priya the main character and her parents were very clear in my mind. Prem, Priya's father is based on my dad, who always believed in me no matter what. The rest of the characters kind of bloomed as I wrote the book. I'm a panster, and although I did a ton of research on mythology and culture to set the scene, I didn't outline the characters or plot too much. The characters came to life all on their own and took over the story. Branches lashed at her face, tangling in her hair and yanking it out of its plait. She focused her every breath on catapulting down the trail, with nothing left for screaming, for calling for help. They were behind her – she could feel them. One, two, maybe more, she wasn’t sure, and it didn’t matter. All that mattered was the trail. This shouldn’t be happening when the sun was high. Surya time was safe. During Surya time, the sun burned their hides and rendered them blind. Her heart pounded. Her foot tangled in a root, and she stumbled, righted herself, and kept running. Stupid, stupid, she’d been so stupid. But then the trail widened. Her heart lifted with hope. She was almost home. They came from the side, hitting her hard and taking her down. Her nails raked earth as they dragged her backward, her final, bloodcurdling scream cut off as they tore out her throat. Priya hoisted the large matka filled with water over the threshold of her hut. The water in the large urn sloshed onto the floor, and she cursed under her breath. Her ankle-length skirt caught on one of the long iron nails hammered into the sides of the threshold; she cursed again as she ripped it free and stumbled into the kitchen. Priya knew when she was beaten. The gossip of the river would have to remain a mystery for a little while longer. She washed while Ma cooked, and for a time they worked in companionable silence. The smell of potato and eggplant curry filled the small space, and despite her irritation with their vegetarian diet, Priya’s mouth began to water. She’d just finished the last tunic and was gathering the clothes to hang out to dry when the silence was filled with the toll of a bell. They exchanged shocked glances. The bell hadn’t been used for at least a year, maybe more. Dropping the clothes, Priya ran out of the hut and into the square where people had already begun to gather. They looked dazed and uncertain as to why they had been summoned, even though it should have been obvious. Debbie Cassidy is a 39 year old multi-tasking ninja who lives in England, Bedfordshire, with her three kids and very supportive husband. Coffee and chocolate biscuits are her writing fuels of choice, and she is still working on getting that perfect tower of solitude built in her back garden. 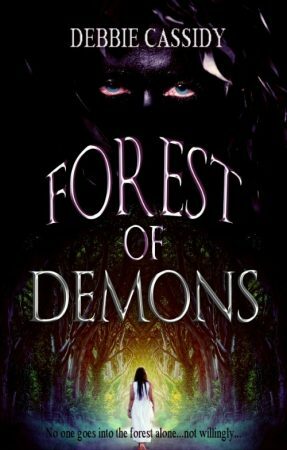 Debbie has been writing for eight years under the pen name Amos Cassidy with her best friend, Richard Amos, but Forest of Demons is her first solo venture, and the first book in a four book high fantasy saga. Filed Under: Fantasy Tagged With: Amos Cassidy, Asian Fantasy, Debbie Cassidy, High Fantasy, Hindu Mythology, Metaphysical Fantasy, Romantic High Fantasy.